Daily Style Entertainment recently interviewed a filmmaker from India Sreedhar TN and it was the best of it kind check out what he has for the entertainment industry. Tell us who you are and your passion toward the entertainment industry? Well, I am a filmmaker and wish to be known as simply that a film maker. I always used to love the fact that how movies create a kind of dream world to the audience. You enter a cinema and presto you are transported to another world and I wanted to create that different world. Entertainment however would be my primary goal. How Long have you been in the movies industry and what is your major role? I have been in the entertainment industry from 2004, started out as a junior member of a second unit film making team and then started out as an independent director in 2014. 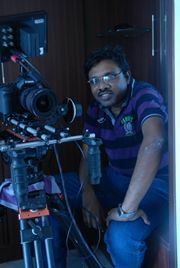 I have also worked in the call center industry till I got my break as a film maker. Tell us one major challenge you have encountered as a Filmmaker and how were you able to overcome it? Raising funds for a movie has always been a major challenge for any film maker and I am no exception to that. I managed to overcome this problem by coming up with scripts which have minimal locations and often waived my director fee or held a percentage in what the movie makes. Do you look forward in shooting a movies with any of the Hollywood stars and who will that be? Well, If I was granted a wish like that, I would choose to work with Michelle Rodriguez and Johnny Depp and make something as outlandish as a Tim Burton Film. When is Tailgater releasing? is there a reason for it to be pushed to late 2017? Now that Indian censors are not permitting you to release "maslaa" in your country? what are your plans? Yes, they felt that since it dealt with Female Genital mutilation and would prove offensive to some section of people, they could not certify it. But we are going in for an online release in June this year. We however did not face any problem in the Middle East or Pakistan and the rest of the world. We heard about some of your documentaries that have been showcased in 75+international film festivals, tell us about some of them. I only made two documentaries Maslaa (which deals with Female Genital Mutilation), Mutabadil (which deals with the exploitation of surrogacy) and yes both of these documentaries have made it to almost all the international documentary film festivals and yes you got your number right. What should your fans expect from you four months from now, and how can they connect to you on social media? I am working on a documentary based on the divorce laws in Islamic society. I have just finished an Animation Thriller titled “Strangers on a Train”. I am currently in talks with tying up with a major online network to produce a crime series in English and Hindi with major Stars and Newbies and hopefully a full length feature in an Indian Language….Like I said these are all in discussion stages and yes in 4 months from now one of these would be on floors. Thanks for being on set with us.